Hand Full of Heads is a demo written using HTML5 and Canvas. This application has heads that can be happy, sad, or angry. Heads are happy if they are near other heads. Heads become angry when they collide with other heads and begin moving at an accelerated pace. Heads are sad when there are no other heads around and move at a slower pace. 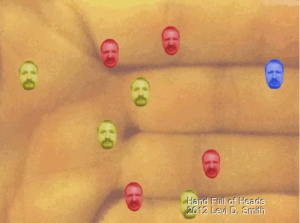 Additional heads can be added by clicking anywhere on the hand. Requires a web browser capable of rendering HTML5 and Canvas.